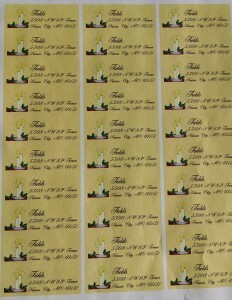 We design and print vinyl and paper stickers, labels and decals. We print stickers and decals for all types of outdoor applications on high quality vinyl stock, using durable inks of all colors. Vinyl stickers resist fading or damage from earth (dirt) air (wind) fire (sun) and water (rain). When properly applied to smooth, hard substrates such as glass, auto paint or metal, stickers can stay on and stay attractive for years. 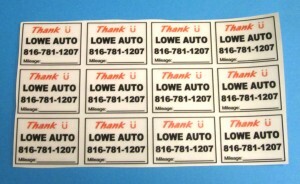 For extended life, we can laminate printed car window stickers with a UV-protective overcoat. Stickers make a bold statement without any complicated tools or processes. For long-term adhesion of several years, choose a hard, smooth surface, and clean it before sticker applications. If you don’t expect the sticker to last more than a few weeks, simply peel and stick for maximum impact on a minimum budget. Paper stickers, labels and decals are designed for indoor use, where they are protected from water, sun and weather. They are printed in black, or in full color on high quality, peel-and-stick stock. We can do small batches, but stickers are least expensive in large batches . They may be irregularly shaped, or may be square, oval or rectangular. For high end labels, sequential labels, and bar codes, see our labels page. Whether you need vinyl or paper, whether your design is simple or intricate, contact Streamline Print & Design at (816) 459-7552 to discuss your sticker, decal or label needs.